I don't know about you, but I have been LOVING the latest enamel pin badge trend. I used to collect them when I was little and now that the trend has returned I am all over it! I was collecting my pins on my fave denim jacket but it was getting a little out of hand so I decided I wanted a place to store my extra pins, so I can swap out the ones I have on my jacket when I fancy a change. 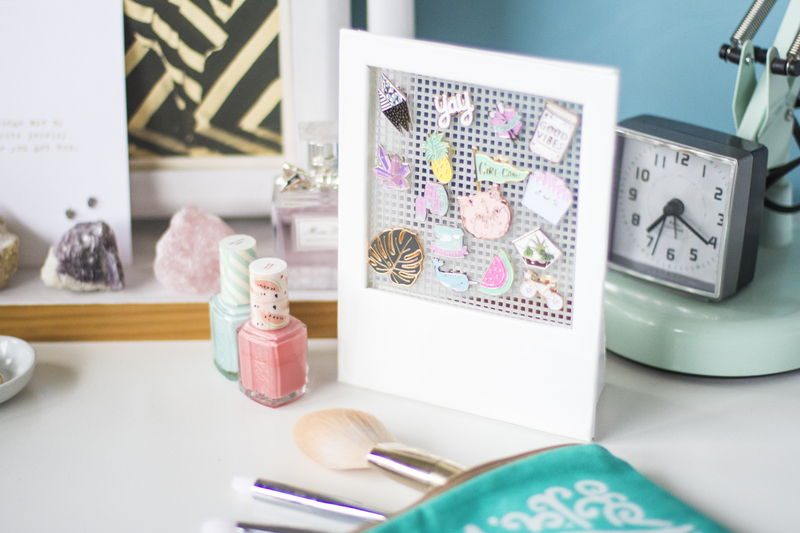 The obvious answer was something as retro as the pin trend itself, a Polaroid pin frame! Here is how you can make your very own. You will need: A4 of Foam core or thick cardboard, white sticky back plastic, A5 plastic canvas, craft knife, strong glue and a ruler. Step 1. Start by cutting the foam core into two pieces approximately 18cm by 14cm, then cut out a 10cm square at the top of both pieces. Step 2. 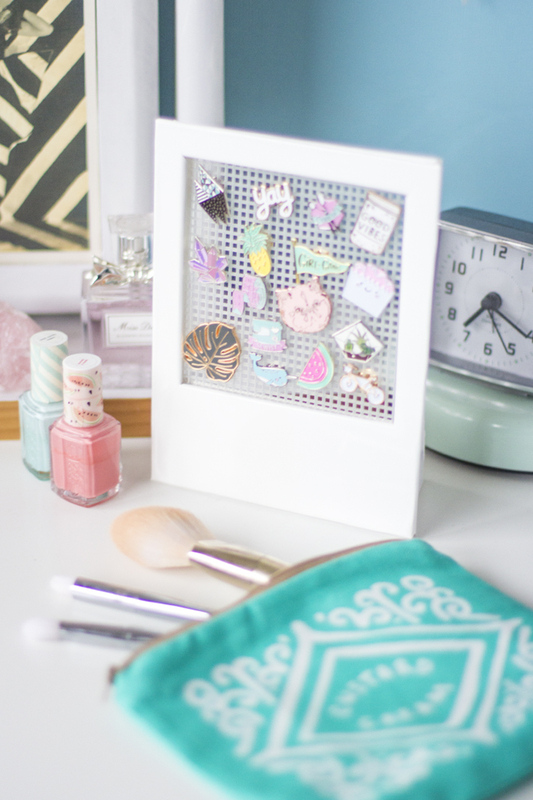 Gently remove the centres of the frames and keep a hold of one of the pieces to use later. Step 3. Take the plastic canvas and cut it to fit the frame. Step 4. Move the canvas to one side and stick the sticky back plastic over the front of the first frame piece. Step 5. Trim the inside of the frame and fold the edges over to the inside, trim the corners from the plastic on the outside, but leave them unstuck for the moment. Step 6. Spread glue all the way around the edge of the frame. Step 7. 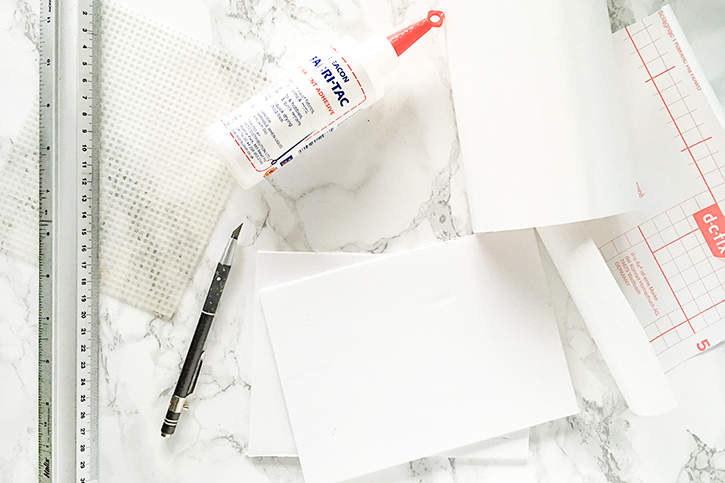 Pop the plastic canvas down over the glue and gently press it in place, whilst waiting for it to dry a little, cover the second frame in the sticky back plastic in the same way as the front, but fold all of the edges over to the back this time. Step 8. Lay down another layer of glue over the edges of the plastic canvas and place the back of the frame down to sandwich the plastic canvas between the two layers. Step 9. Now you can fold over the edges of the sticky back plastic from the front all the way over both layers of the frame to keep it all together. Step 10. Take the centre piece of the frame you put to one side and cut it in half diagonally to create the stands. Step 11. Glue one edge of each of the stands and stick them to the back of the frame. Step 12. Wait for the glue to dry fully then you can stand up your frame and add your pins. The best thing is you can write on them with a sharpie, just like old school instant photos too!! 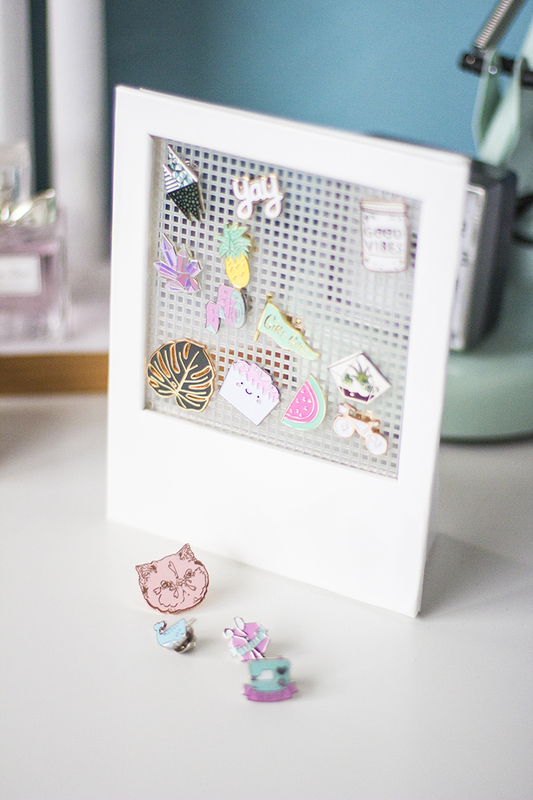 I love how this looks on my dressing table and it means I can have all my fave pins on display. 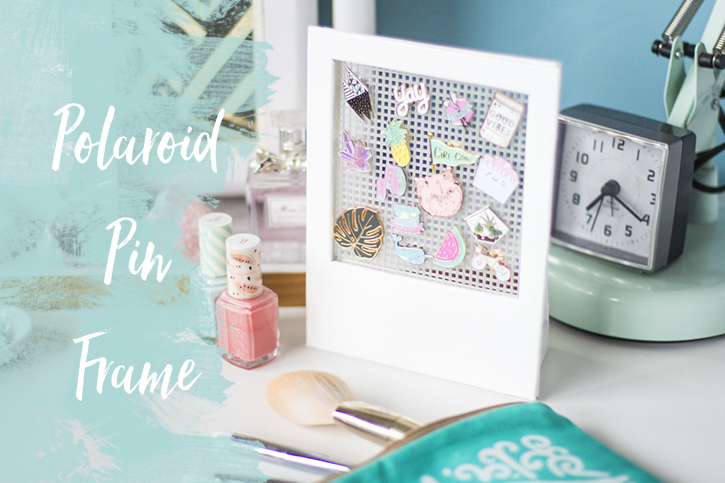 Worried you can't fit all your pins in one, why not make a few and have them grouped together with different phrases on. You can always remove the sharpie with a little nail polish remover if you want to change it up. 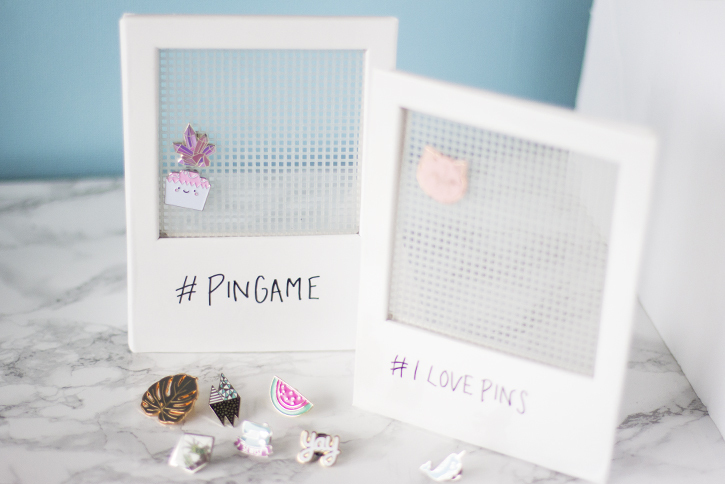 Or if you don't have a big collection of pins you can also use it for earrings!